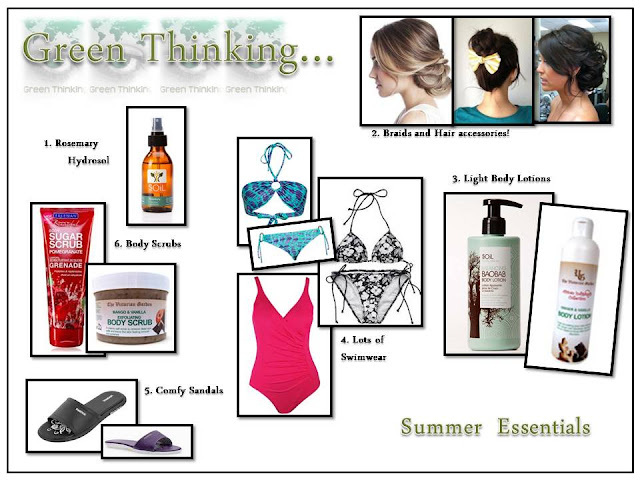 Summer Must Haves: Green Thinking / Gee Whiskers! There have been so many great Summer Must Have posts over the past few weeks and this week we have the lovely Rochelle from Green Thinking sharing her summer must haves. In summer, I don’t blow dry my hair. It just gets too hot and it’s also nice to give my hair a break. I use the Rosemary Hydrosol after I washed my hair, when it’s towel dry. Rosemary is awesome for dark brown hair! I have very long, thick hair, so in summer, it all goes up! The Free State summer is just too hot to wear you hair down. This is usually the time when I experiment with up-dos, braiding my hair or using headbands. This is one of the fun things of having long hair...the possibilities are endless! I love using body oils in winter, but in summer I switch to Light Body Lotions. My current favourites are Quince & Orange Body Lotions by Victorian Garden and Soil’s Baobab Body Lotion. The Quince & Orange has such a fresh citrusy smell, while the Baobab lotion has a sharper Geranium smell. So although most of you will know I am quite a ‘boeremeisie’, I actually grew up in Cape Town. So it’s quite normal for me to own a lot of bathing costumes! We also have a pool at our new home now (so blessed! ), so it prevents my swimwear from wearing if I alternate them! When I get hot, I am just too lazy to put on sandals with straps and ‘things’. So I just put on slip-on sandals. It’s just soooo comfy with no hassle! I found these Reebok ones, and liked them so much, I bought two pairs of the same kind! This is the perfect time to slough off your winter skin. My ultimate favourite no-better-scrub-than-this is Victorian Garden’s Mango & Vanilla Salt Scrub. It smells divine and is even used in fancy Spa’s like the Librisa Spa at Mount Nelson hotel. I also received a Freeman’s Pomegranate Sugar Scrub as a gift. It’s a delicate scrub, with a soft rose smell. Such a treat! Summer here I come! Thank you so very much for sharing all your must haves for summer. There are many goodies on here that I will be going out to get for myself. Don't forget to visit Green Thinking!